Thank you for visiting. As children get older they might progress on to building block toys and then to more intellectual games and toys like Chess which helps to sharpen the mind. Perhaps a word game like Scrabble would be challenging too. I don’t subscribe to the ‘Lego is evil’ brigade but, at the same time, some of the Legos now produced is quite weird. Gone are the old yellow heads; to be replaced by more realistic features and weirder monster heads as shown. Stranger still are the worms, Scorpions, Frogs, Spiders, Bats, Rats, Snakes and other Lego creepy animals. All of these plastic bugs are compatible with the bricks. Kids used to be happy with regular blocks and even the Lego minifigure series were a novelty. Further advances in technology allowed Lego to create Lego sets with realistic figures that looked exactly as they should look, especially those from movies such as Harry Potter, Star Wars and Batman. All was still ok but when you find these weird attachments for sale you begin to wonder what Lego are trying to achieve with their bugs and slugs. I think they should keep to the tried and trusted and stick to bricks. 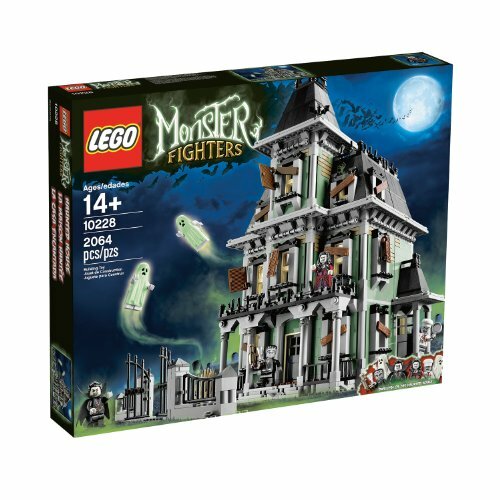 Get some GHOSTLY LEGO from Amazon. Perhaps they need to compete with Mega Bloks and KREO, who may be encroaching upon their market share but, is this the way to retain top spot in the children’s building block business? 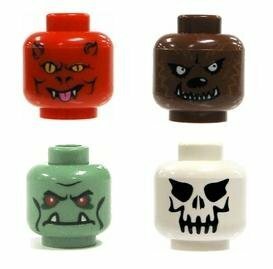 The small odd parts, that are now so popular, have in fact, helped those of us who cannot afford to buy full block sets just in order to obtain a specialized Lego character. On a more positive note, it is possible to buy cheap Lego minifig heads, hair, arms and torso spare parts for Lego; which enable you to create your own realistic superhero figures. The spiderman, Batman and Superman Lego toys retail for exorbitant amounts of money with very few bricks included. There are no bricks at all in the Lego Cake Mold, Lego Dish Set, Lego Stickers or Lego Jigsaws; but there are more weird products than these available. Here, pictured, are some odder Lego bits and pieces. I see no point in the Lego radio (blue radio top left) and I am sure that children will have no interest in it either. The Lego mug is what? It has nothing to do with the bricks and will not attach to anything worthwhile nor will the kids need a caffeine boost via a mug of coffee. It is also too small to hold more that a few Lego bricks. The mug (not a toy at all) is a very odd ornament, although it is Lego endorsed. Also branded by Lego is the ice cube maker which is hardly going to be of interest to anyone but adults. The green, street sign (top right) says ‘Lego Dr.’ but who will want such an item, I cannot imagine. Even for collectors of ‘real’ road signs with miles and destinations this item offers very little appeal. It is possible to buy chocolate Scrabble, chocolate Monopoly sets and even chocolate chess pieces but they are more up-market and exclusive when compared to this edible toy. What is not endorsed is the Lego candy, shown at the bottom left of the image. It is quite realistic looking too. Lego are always at pains to point out that Lego is not for very young kids to play with. Their reasoning is clear, because of the choking hazard involved with the small hard plastic bricks. So, what is the candy manufacturer at? Incredibly, they produce a strange product that looks exactly like a toy and children can eat it. Talk about giving kids mixed messages!